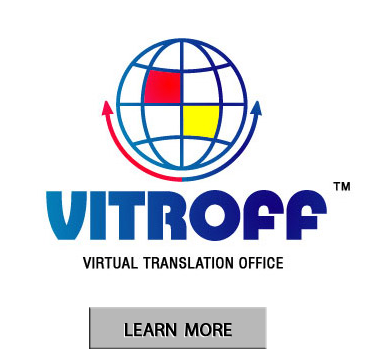 Vitroff is a free open source web based translation project management software for your translation agency, which allows translators, customers and project managers to collaboratively work online. The software is brought to you by 1translate.com. They provide Russian translation services, interpreting services in Moscow and Russian voice over services. The software can be integrated with your website and can automatically publish rates, receive and calculate translation quote requests, display statistics, receive translators' applications, etc. Feel free to download and use it on your website. Vitroff is looking for a php programmer. Please send your resume to supp at vitroff dot com. 1translate.com - Russian Birth Certificate Translation and other Certfied Russian translation services.